PLEASE READ THE INFO BELOW - IT IS VERY HELPFUL IN PREPARING FOR YOUR APPOINTMENT, thank you! The appointment is for 10 minutes but the child only sits for about 5 minutes. 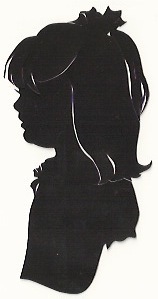 The artist is very experienced with wiggly children and can almost always capture them in silhouette. Please bring your phone or a distraction such as a book or toy if you think that will help. No eating during the silhouette please, that can be a special treat for after. A deposit of $37, the cost of the silhouette, is required to hold each appointment. This cost covers the original matted silhouette, and unless purchasing frames and/or duplicates, you will have nothing else to pay the day of the appointment. You may order duplicates (cut at the same time as the silhouette, using multiple sheets of paper at once) for $15/per copy at the time of your appointment. The copies are fantastic and affordable GIFTS! Each silhouette comes matted. You may opt to put families together on one mat and the artist carries several size mats for this purpose. Traditional silhouette frames are available and are high quality, hard to find, all wood black oval frames with a gold leaf inner rim in sizes 5x7 at $35, suitable for one silhouette and 8x10 at $45, suitable for 2-3 silhouettes. The artist frames the silhouettes at the time of your appointment. Should you find you need to cancel your appointment, please do so within 24 hours of the event if possible by contacting the artist Marcella at [email protected] or (774) 200-5461. If no contact has been made within 24 hours before or after the event, the deposit is non-refundable. Please do get in touch, we are very willing to work with you in case something comes up. Please contact the artist, Marcella, at [email protected] or (774) 200-5461 with any questions.